You. You're going to be the one buzzing this Halloween, because you're not just going to go in any old costume selection this year. You're going to be a sweet bug who really knows her honey. You're going to be all the buzz, and what everyone's talking about too. Because you're going to be the Bumble Bee Babe! This costume will make you the tip top buzzing beauty in your wild flower patch, but you sure don't have to live up to any expectations when you choose this costume. You can be the sweet bee, the sassy bee, or even the queen bee. It's all up to you! We think it's important to have big time bee-aspirations, after all. 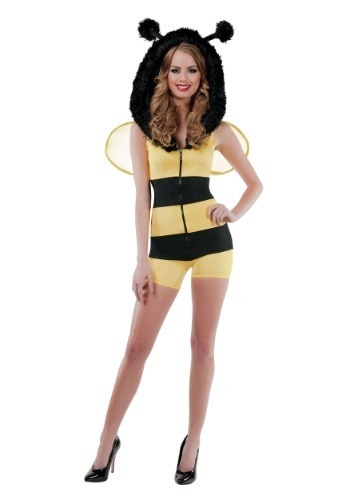 We're sure when you choose this costume, all your friends will be extra abuzz. As a hooded zip up romper, this suit also has attached wings and a pointy tail. Twin fur antennae make you look extra buggy, and the luxe faux fur hood adds a little glamor to your queen bee routine. We're sure you'll love the style that this costume brings to your Halloween. Because this year you're going to be the Bumble Bee Babe! Buzz buzz buzz!